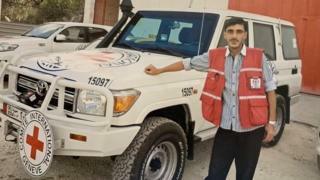 The Red Cross is seeking information about three staff members abducted in Syria five-and-a-half years ago. In its first detailed statement on the incident, it says Louisa Akavi, Alaa Rajab and Nabil Bakdounes were seized in October 2013 while travelling to Idlib province in north-western Syria. Ms Akavi was held by the Islamic State group and there is evidence she was alive in late 2018, the Red Cross says. “The past five and a half years have been an extremely difficult time for the families of our three abducted colleagues. Louisa is a true and compassionate humanitarian. Alaa and Nabil were committed colleagues and an integral part of our aid deliveries,” said Dominik Stillhart, ICRC’s director of operations. Is this the end for Islamic State? There are increased concerns for Ms Akavi’s safety following the fall of the last territory held by Islamic State (IS) near the Iraqi border last month. Ms Akavi spoke of her work in a 2010 interview for a New Zealand newspaper. “It does become a little bit hard, but it is the small things. It’s working with the national staff who do the best they can,” she said. “We are speaking out today to publicly honour and acknowledge Louisa’s, Alaa’s, and Nabil’s hardship and suffering. We also want our three colleagues to know that we’ve always continued to search for them and we are still trying our hardest to find them. We are looking forward to the day we can see them again,” Mr Stillhart said. Louisa Akavi is a veteran of conflict zones who has worked in Bosnia, Somalia, and Afghanistan. She survived the 1996 attack on the Red Cross compound in Chechnya, in which six colleagues were killed. In 1999 she was awarded the Florence Nightingale Medal for services to nursing. The ICRC, which worked tirelessly behind the scenes to find her and the two Syrian staff members abducted with her, knows that she spent time in Raqqa, and that she was alive at the end of last year. Refugees fleeing the last strongholds of Islamic State report seeing her, still working as a nurse. But no-one can know what she experienced, and what her mental state is now.